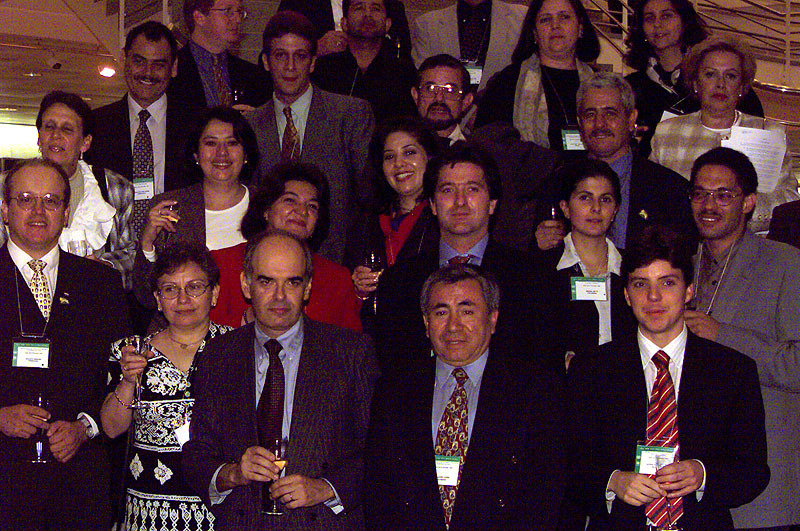 Everton Vargas, Chair of the Legal Drafting Group and Brazilian delegate [3rd left, front row] celebrates with other delegates at a champagne reception following Friday's closing Plenary. The Plenary session saw the adoption of the Protocol on Liability and Compliance in spite of difficulties faced earlier in the week, which are speculated to be indicative of widespread and long-term dynamics which have yet to be fully resolved. Nevertheless, the adoption of the Protocol and its amendments were a fitting benchmark for the 10 year anniversary of the Basel Convention on Transboundary Movements of Hazardous Wastes and their Disposal. Brazil delegate and Chair of the Legal Drafting Group, Vargas, presents the final text of the Protocol on Liability and Compensation, with minor amendments to typographical errors. The Protocol is accepted by Philippe Roch, President of the COP, to much applause from the floor. Klaus Töpfer , Executive Director of UNEP, congratulates the Parties on this achievement. Australian delegate, Mark Hyman of Environment Australia voices concerns over certain elements of the text of the Protocol. Australia argues that the Protocol's questionable applicability may cause uncertainty between regimes, potentially creating confusion, increasing costs, and resulting in protracted litigation suits. Furthermore, the effect of channeling liability to the exporter rather than those in operational control, is argued as not properly reflecting the 'polluter-pays' principle. Australia's comments on Annex B include concern over financial limits being determined by domestic law without centralized guidance, and that a conflict of interest may arise if minimum liability levels were established by the regimes of individual Parties - policies which other Parties would not be able to influence. The overall effect is thus argued to not adequately provide certainty or consistency of application of the Protocol. Australia believes that maximum limits should be set in the Protocol text and that they should be set lower than is proposed, and since minimum liability limits are purely quantitative measured in tonnage, they ignore qualitative indicators of hazard risk. Thus, Australia feels that the Protocol text has serious deficiencies and that it needs to be made more viable and practical in order to expedite ratification of the Parties to the Basel Convention. Canada aligned itself with Australia's concerns. Philippe Roch, accepted Australia's remarks, taking them to mean that Australia was not opposed to the adoption of the Protocol, and that those remarks will be integrated in the Report of the Secretariat. [left] Speaking on behalf of the European Union, Tuomas Aarnio from Finland Ministry of Environment offers support for the Protocol from the EU. He adds that the EU is aware that funding is of prime importance to the effective implementation of the Protocol, and that EU member states are seriously considering a commitment to the Technical Cooperation Trust Fund for emergency cases. Daniel T. Fantozzi of the US Department of State speaks on behalf of the United States delegation observing the COP5 [right]. While the US is not Party to the Basel Convention and the issue of ratification has not yet reached the Congressional agenda, delegates observing the COP-5 made a statement reassuring the country's interest in further participation. Fantozzi, Director of the Office of Environmental Policy with the US Department of State's Bureau of Oceans, Environment and Scientific Affairs, noted that the observing delegation was proud to have two senior Congressional representatives working with them, carrying the legacy of one of the US's most ardent Basel Convention supporters, the late Senator Chafee. More substantive examples of the US's interest included cross-border agreements with Canada, an indefinite moratorium on the deconstruction of ships, and their voluntary contributions being the 3rd largest. [left] Philippe Roch, State Secretary, Head of the Swiss Agency for the Environment, Forests and Landscape (SAEFL) and Basel COP5 President, shares a toast with Juliette Voinov of the Earth Negotiations Bulletin, International Institute for Sustainable Development (IISD). [above] Delegates of the Conference of the Parties celebrate the adoption of the Protocol at a champagne reception hosted by the Basel Convention Secretariat, the Swiss Government, and the United Nations Environment Program. Basel Convention Official COP-5 Homepage : UNEP. COP-5 Documents : UNEP's pre-session documents available in 6 languages. ï¿½ 1999, Earth Negotiations Bulletin. All rights reserved. To listen to IISD's RealAudio coverage of the Basel Convention COP-5 deliberations you will need the free RealAudio Player. Download the free Real Audio player by clicking on this button.